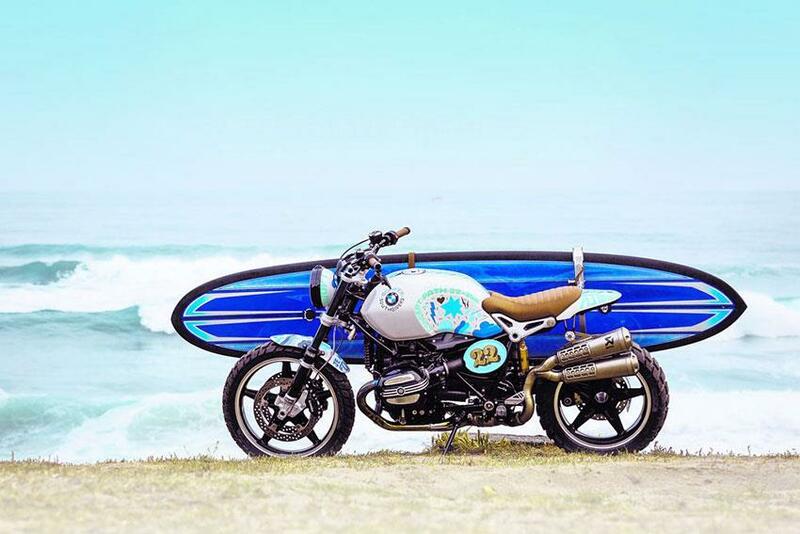 Ignore the surfboard hanging off the side, the eccentric paint job and concept bike tag, because this is the shape of the forthcoming BMW R nineT Scrambler expected to be launched at the Milan show this Autumn. This bike – dubbed Concept Path 22 – was launched last weekend at the Wheels & Waves custom bike show in Biarritz, France. MCN revealed BMW’s plans to release a Scrambler version of the big-selling R nineT two months ago, and this Concept Path 22 is clearly far more than just another concept bike; it appears to use real production parts that will be seen on the finished bike. The fuel tank is a cheaper pressed steel version that will be used on the Scrambler instead of the expensively handmade aluminium tank used on the R nineT roadster, the fork is a lower-specification than the S1000RR superbike-derived set-up used on the nineT, while the fork fitted here boasts Öhlins internals that are unlikely to feature on the production Scrambler. Hanging off the fork legs are the mid-spec Brembo calipers we expect to make it to production, gripping discs fitted to mag-style wheels that also match the style seen on leaked BMW sketches of the production bike. Even the front light appears to be the finished unit. BMW have been clever with the way they have managed to reduce the cost of the high-end parts used on the R nineT to make the Scrambler model more affordable. Ola Stenegard, Head of BMW Motorrad Design, says: “The idea of a BMW scrambler is not new to us. Now seemed to be the right time to present our interpretation of this legendary vehicle concept.” At the heart of the Concept Path 22 there is a powerful two-cylinder boxer engine with cardan drive - as is typical of BMW. The single-sided swing arm makes the five-spoke rear wheel visible, again a familiar BMW feature.